The southern side of Lake Garda is a land spotted with different greatly fascinating towns. One of these towns is San Felice del Benaco, established among the three ancient hamlets of S. Felice, Portese, and Cisano, all on the moraine pomontory that faces the lake. The promontory of San Felice has been inhabited since the stone age. Various archeological findings, such as a tombstone dedicated to the god Neptune, testify to roman presence in the area. Back then the town was known as Scovolo, from the latin word scopulus, meaning “cliff”. During the 10th century a castle was built to protect the town from barbarians' raids. In 1279, when Brescia conquered the western side of the Lake known as Valtènesi, they destroyed the castle and village, to rebuild the new Castle of San Felice, then renamed the place San Felice di Scovolo. The territory then fell in Visconti hands, then in French hands and at last in those of the Serene Republic of Venice, all in a succession of events and conflict. The three hamlets of San Felice, Portese, and Cisano became the town of San Felice del Benaco in 1927. According to tradition, Saint Francis of Assisi built the first dormitory for roman friars here. The town of San Felice holds in its town center the Castle and Palace Rotingo, built in the 17th century and currently town hall. Strolling in the town’s alleys you may discover the church, an elegant baroque building, and the ex Monte di Pietà of San Felice, built in a venetian style. Just outside of the historical center is the Madonna del Carmine sanctuary, a romanesque church built in 1460. Portese’s downtown area is known for its dock and its beach. The Nautic Circle is very active here and promotes events such as the “Exposition Trophy” and the “Trans Benaco cruise race”, a great summer manifestation and important regata that calls hundreds of fans to Portese every year. Another must-see are the remains of the medieval castle, of which only a circular tower remains. The hamlet of Cisano is on the top of a hill where you can admire the landscape of the gulf of Salò. The town’s atmosphere is calm and relaxed, reminiscing of old times whencows would still drink from the fountain in the town square. 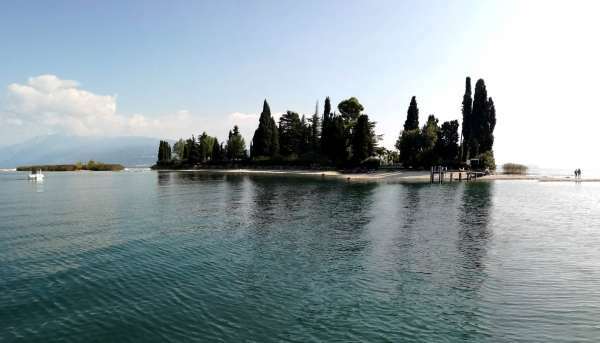 2018 has been a very positive year for tourism in the Lake Garda area, and San Felice has one of the most surprising numbers: more than 700.000 recorded visitors. San Felice del Benaco is the ideal place to relax and have a good time. The area’s beauty has been known and appreciated since ancient times, to the point of it being known as Sinus Felix, or happy inlet. The special microclimate of the lake allows the cultivation of mediterranean produce like lemons and olives. Local products can be bought at the weekly market that San Felice hosts every wednesday. All year round various family friendly events are hosted here, such as children movie nights, concerts, theater shows, and art galleries. San Felice is on the western coast of Lake Garda, roughly 35km from the city of Brescia. It is placed on a promontory that separates the gulf of Salò from the gulf of Manerba. Three mountains are located near the town: Monte della Croce (Mountain of the Cross), Monte Campagnolo (countryside Mountain), and Monte Santa Maria(Saint Mary Mountain), all that offer excursions greatly appreciated by trekking lovers. The climate is mild and pleasant all year round. Each seasons offers surprising natural spectacles, like the trees’ blossoming in spring, summer sunsets cradled by the breeze of the lake, and the colourful autumn days accompanied by the sun. The temperatures remain pleasant in winter as well. Bicycle lovers can bike down an 18km long bike path that unites the towns of San Felice, Portese, Cisano, and Salò. In the summer, during the months of July and August, the town’s surroundings may also be visited with a tourist train. During a holiday on Lake Garda, circumnavigating the Island of Garda, the biggest and most important island on the lake, is an activity that can’t be missed. The island “belongs” to the town of San Felice del Benaco and the best starting points to live this experience by boat are Portese, Salò, or San Felice del Benaco. It is an island filled with history, charm, and legends that make it worth being appreciated from a different perspective, especially between April and October, when boat trips to the island are available (See Itinerary 3). In the midst of the greatly green vegetation of the island, the italian style gardens and the woods made out of cypresses and pines, is a luxurious palace belonging to the Cavazza family. In front of Garda Island, 600m from its coast, is the promontory of San Fermo, where a little church of the same name is placed. Here you can get a beautiful look at Lake Garda.